Graffiti is defined by Oxford Dictionary as "writing or drawings scribbled, scratched, or sprayed illicitly on a wall or other surface in a public place," and its practice goes back to the dawn of civilization (and even further into the past if you count the petroglyphs etched on cave walls by prehistoric peoples). Yes, since time immemorial, men and women have “tagged” their names and messages on just about every conceivable place. Things aren’t so different nowadays, although the methods have changed and the consequences of its application have become more complex. In NYC, graffiti artists (known within their community as “writers”) were once rebels of society, an anti-establishment subculture that expressed the language of hip-hop culture. In the '70s through the early '90s, graffiti was considered to be vandalism and defacement of property by not just the law but by the city dwellers, too, as evidenced by the many frowning New Yorkers who rode on trains that had been tagged or “bombed” with spray paint. Using the term “bomb” in a post-9/11 NYC, however, has certainly lost its appeal, and a post-Mayor Giuliani city saw a new cleaned-up model of shiny, metallic subway cars that all but eradicated the once-ubiquitous graffiti that once served as wallpaper behind every New Yorker's commute. But the subculture that was graffiti continued to grow and spread internationally. These days, it’s more commonly called “street art” and the practitioners of this specialized art form come from a much larger pool of people with different social, ethnic, and educational backgrounds. The art you will see on the streets of New York City today reflect styles that might include Latin-American-inspired political murals and stencil art, Asian cartoons, variations of high-brow art, an homage to the hip-hop style of old, and more. In the wake of a tidal wave of gentrification transforming New York City at alarming speeds, the status of street art has also become a tricky subject matter to discuss. Although street murals are celebrated as the beautification of urban settings, it has also come to be dreaded as harbingers of money and affluent transplants moving into neighborhoods, of displacement, and of cultural appropriation for commerce and real estate development. Nonetheless, street art in NYC continues to be thought-provoking and pleasing to the eye. Once upon a time, there was a place in Long Island City (L.I.C. ), Queens, that was known as the world’s “graffiti mecca": 5 Pointz. Here, on the walls of a 200,000-square-foot factory building that once manufactured water meters, many hundreds of spray-painted murals by an international 'who’s who' of legendary aerosol artists materialized. 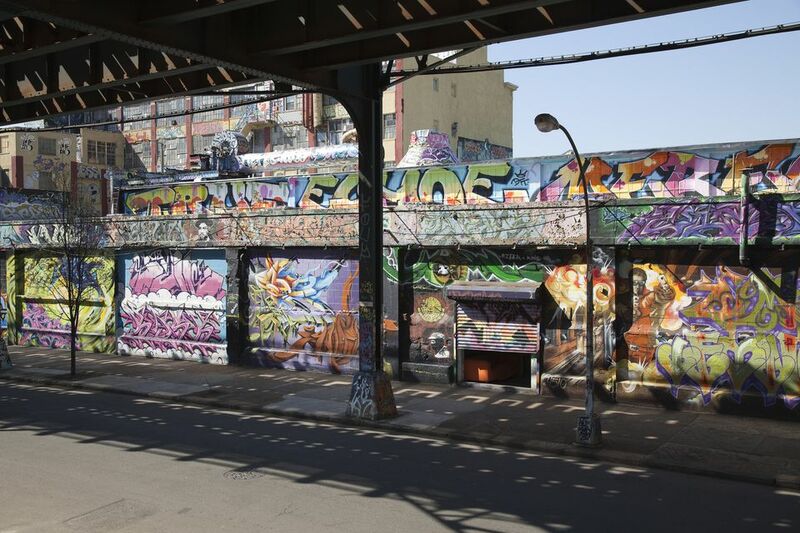 When the industrial site first became a canvas for ‘legal’ graffiti in the early 1990s, it was known as the Phun Phactory, before ultimately being renamed as 5 Pointz – to signify the five boroughs of New York City coming together as one. Unfortunately, in 2014, 5 Pointz fell to the wrecking ball of development, but in its place has sprouted many nearby street art projects, both of the legal and illegal varieties. Walking through the streets of L.I.C., you might come across some random stencil art or small-scale mural. Given how many artists have studio space in the neighborhood, it’s fitting that the arts scene has also spilled out onto the streets and building exteriors. There is one site-specific public mural project in the neighborhood that covers half a city block on a three-story building; it's provided a lot of canvas for participating artists. The project is called Top-to-Bottom, a graffiti phrase that speaks to the one-time feat of painting the entire width and height of trains. The murals are visible from the street, from the elevated 7 subway line tracks, as well as from the Queensboro Bridge. A good starting point to appreciate Top-to-Bottom is at the intersection of 21st Street and 43rd Avenue. The Technicolor creations will just pop out at you: Take your time and walk around the building – the murals come in all shapes and sizes, including both solo works and collaborations (with some designs uniquely shaped to the structures and environment). The 60 contributing artists included highly celebrated talent like Magda Love, Daze, Crash, Cekis, Werc, Alice Mizrachi, Case MacLaim, Erasmo, Cern, Alexandre Keto, Li-Hill, See One, Icy & Sot, and more – they hail from 14 different countries (Germany, Canada, Mexico, Argentina, Belarus, and more), as well as locally from all five boroughs of the city, including, of course, Queens. We still mourn the loss of 5 Pointz in L.I.C., but the spirit of street art lives on in this dynamic neighborhood. If you still haven’t had your fill of amazing Queens street art, you're in luck: Simply head over to neighboring Astoria, where all is well in the street art world at Welling Court. Bordering the waterfront at Vernon Boulevard and to the north, Astoria Park, this small tucked-away quarter is a made up of a hodgepodge of residential and industrial buildings, offering a variety of surfaces on which artists can paint and experiment. The large steel doors and grates of the many brick warehouses here have been covered with artwork, giving the impression of framed graffiti masterpieces displayed throughout an urban open-air museum that spans several blocks. There are also pieces that curve around walls and fill in crevices, adding layers and depth to the viewing experience. The community not only welcomed but invited organizers Ad Hoc Art to curate and oversee the manifestation of these magnificent mural masterpieces (say that three times fast!). The result is an 8-year-long running project that continues to grow in stature and scope, as spearheaded by founder Garrison Buxton. The murals can be enjoyed in any order, and no one particular starting point is recommended, given that the sprawling mural route spreads out in many directions. The 8th annual Welling Court project’s outdoor gathering and official reveal of a new batch of wondrous eye and brain candy take place on June 10, 2017. The creation of the new pieces will take place one week prior to that, so feel free to stop by then to see the artists working on their mural magic. In 2017, over 130 artists from more than 20 countries will participate, including heavy hitters of the street art scene like Joe Iurato, Rubin 415, Werc, and some fantastic female contributors like Katie Yamasaki and the return of the legendary Lady Pink, Queens-native-by-way-of-Ecuador and “first lady of graffiti” who has been an active ‘writer’ since 1979. Besides these exceptional curated projects, street art can be found sprinkled throughout the borough of Queens, whether it be crude or expertly crafted; respected and preserved, tagged over and defaced, or already vanishing with time. In Queens neighborhoods like Woodside and St. Albans, you will find one-off murals that celebrate local singers, actors, rappers, neighborhood pride, fallen heroes, and statements of hope and loss. Perhaps somewhere in that mix is a budding artist looking for an entrée into the professional and profitable world of galleries, museums, and merchandising; maybe the next Basquiat, Banksy, or Shepard Fairey. Or, possibly, it’s someone whose face you’ll never know, a mysterious painter of personal and coded messages with meanings you may never fully grasp, visual poets of the ephemeral, sharing their vision right here in Queens.